Colleen from Scrappin Granny here today to share a fun and recycled project. I started with a wine bottle that normally would have been thrown away. I spray painted the bottle with some brown spray paint. 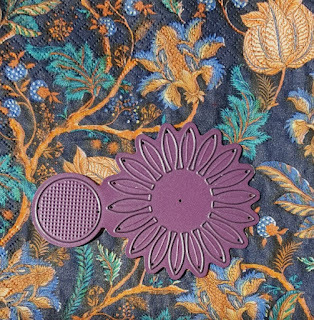 Next I had purchased some napkins that had beautiful and rich fall colors and I used the Sunflower die by Cheery Lynn to cut out flowers and layered them together. Since I didn't want them to be Sunflowers I used the center piece and a punch and punched out a smaller circle for the middle. 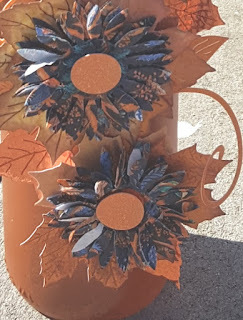 I glued the flowers onto the bottle and added fall leaves behind the flowers as well as some vines. I used the Cheery Lynn Dimensional Small Leaves to cut out the leaves that are behind the flowers and then used Cheery Lynn Fanciful Flourish for the leaf flourish. Finished off the bottle with some brown and gold ribbon trim. Now you have a beautiful fall bottle that normally would have been in the trash. Until next time have fun creating. WOW! Gorgeous! What a fabulous use of dies! I always thought I loved wine bottles as is, you know filled with wine...tee hee This is glorious! 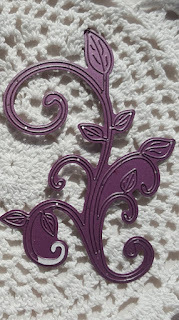 I must try one next as I adore making Wine Bottle Tags, but you have taken this to the next level, WOW! The sunflowers look amazing! That is over the top creative. Just genius.....I love it. Now I must go drink a bottle of wine to get the bottle...lol. Your flowers are just fabulous! Great idea to use the napkins. What a beautiful Fall home decor piece. Love the rich warm colours. Love the idea of using the napkins for the flowers - makes them so delicate! fantastic upcycling! I would use this decor any time! just lovely!